​Want to experience the thrill of grape picking and crushing during the 2019 vintage? Many wineries are celebrating the 2019 harvest with fun events like grape-picking parties and others that could be described as winemaking bootcamps as they show you what it's like to be a winemaker for a day. 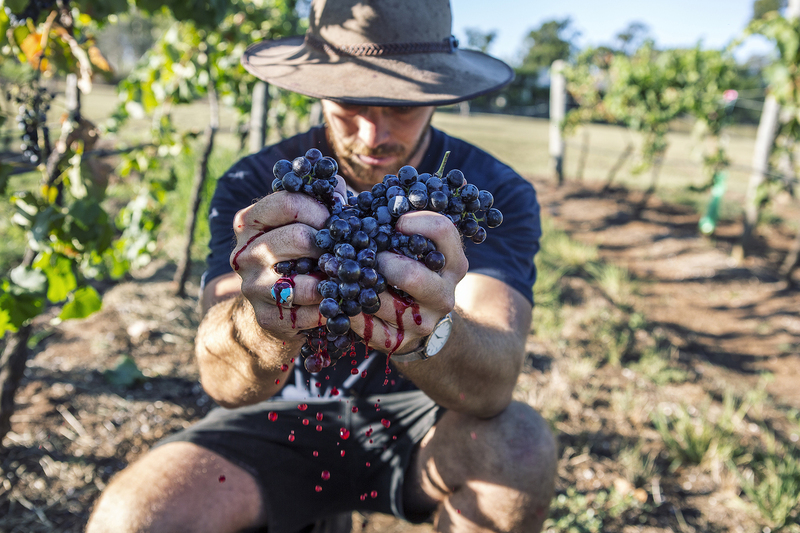 Harvest traditionally kicks off about 100 days after the vines flower and in the Hunter Valley that's usually between January and March, however the dates vary each year depending on the weather. That's why some of the wineries mentioned here don't have specific dates for their events as it will depend on how quickly the grapes ripen, so if you want to score tickets you'll need to mimic Usain Bolt and get in fast as there are limited numbers. Plus, some are member-only events so you'll need to sign up for membership to take part or go on the waiting list. And remember, if you're going to be stepping into the shoes of a winemaker you need to dress like a winemaker. That means enclosed, flat shoes for work in the vineyard and winery, and casual clothes that you don't mind getting dirty. Glandore's 2019 Family Picking Day is being held on January 27 even though the wine team admits vintage is a tricky time of year to predict exactly when the fruit will be ripe. But they're pretty sure their Chardonnay vineyard will be ready towards the end of January so that's the date their loyal friends and families can experience the behind-the-scenes action of a functioning winery in the middle of vintage. Elbourne Wines holds grape-picking events each year for both Chardonnay and Shiraz, followed by a "harvest celebration" lunch (after a dip in the pool!) which is free of charge for anyone who has helped picked grapes. And everyone is welcome – not just wine club members. "The more hands the merrier," says Adam Elbourne. "Usually we pop one of our home-grown suckling pigs or lambs on the spit, which feeds plenty and we try a few back vintages of our wine as a thank you to the pickers! "The only problem is we can't give much warning on the exact date given the uncertainty on when they are ready to harvest (as a guide Chardonnay is often picked the Australia Day weekend with Shiraz about a month after that – mid- to late-February). So the best option is for people to put their name down on our wine club mailing list elbournewines.com.au/wine-club/ to receive the announcement on picking dates." Margan will be holding its annual Harvest Lunch on February 17, which includes a vineyard and winery tour led by winemaker Andrew Margan and a 'get-your-hands-dirty' aspect that will include grape-picking and/or crushing of grapes from the 2019 vintage. Again, it's weather dependent but will most likely include picking Barbera – the Italian red grape variety – and crushing it in the winery. The event also includes a tour of the restaurant's one-acre kitchen garden, a vermouth cocktail-making class and a sit-down, three-course lunch with matching wines. Everyone welcome. $150pp; members $135pp. It's a real family affair at Peter Drayton's Grape Stomp on February 17 where you'll be picking and stomping the Hunter's signature red grape variety – Shiraz. Everyone is welcome to enjoy a hot buffet breakfast with sparkling wines and craft beers from the onsite Ironbark Hill Brewhouse. Then the fun and games begin, with grape picking, games, live music and a jumping castle and face painting for the kids. You also take home a souvenir t-shirt or hat. Tickets available through stickytickets. $85pp; kids $45pp. Oakvale's Crush Party is another popular annual event, which will be held twice this year – on February 23 and March 2. It's an exclusive members event with limited availability. You can spend the day with the winery team and experience a Hunter Valley harvest with everything from grape picking, sorting and stomping, followed by a hearty banquet lunch in the vineyard, live music, as well as all your Oakvale favourites by the glass. Members $128pp; non-members $160pp. Another spot where you can kick off your shoes and crush grapes like the Romans did. The Experience Harvest event pays homage to the mighty grape with a host of activities for wine lovers including fruit picking, grape stomping, Baumé analysis, juice tasting, tank tasting of the current vintage and a winery and vineyard tour. Afterwards tuck into gourmet antipasto platters and a complimentary glass of wine. It's usually held mid-February. Members $45pp; non-members $50pp. You might not know that you can adopt a vine at Drayton's Family Wines. One of the benefits of the adoption is that you can follow the life cycle of your vine, taking part in all aspects of the process. Each year Adopt-A-Vine 'parents' are invited to harvest the grapes from their vines – usually mid-February – and the day includes tours of the vineyard, winery and museum, tastings from the barrel, tank and pre-release wines and a leisurely lunch. $30pp for Adopt-A-Vine members; non-members $40. Winemaker Angus Vinden also runs a picking and crushing day in late Feb/early March for members and friends. It's a real hands-on experience as you get to pick grapes in the vineyard, load them by hand into the fermenters and then take off your shoes and socks and stomp the grapes with your feet in the fermenters. After all the work's done for the day, Angus provides lunch for the pickers. It's a free event and the perfect way to get a glimpse into the winemaking process. The exact date is vintage dependent, so you'll need to check in with him for specific dates. Brokenwood's mission statement to 'make great wine and have fun' is encapsulated in their Get Your Hands Dirty event. It's an annual harvest celebration with members picking fruit from the vineyard, touring the winery and stomping grapes in fermentation tanks before enjoying lunch. It's being held on February 16 but, alas, is already sold out, but members can go on the waiting list. $200pp. You can also discover what's in a day's work for a winemaker during vintage at Stomp Wines on March 2. Your activities include measuring grape ripeness, sampling the 2019 juices and ferments, blending and tasting, training in the art of pigéage or foot stomping ripe, juicy grapes and creating your very own stomped T-shirt as your keepsake. Grape picking, grape stomping and barrel rolling are just some of the fun activities held throughout the day at The Vine To The Glass event held on the lawns at McLeish Estate on March 16. This annual celebration is a great way for wine lovers to experience vintage with a live band belting out tunes, local food trucks serving gourmet food and McLeish wines and regional platters available at the cellar door for guests to enjoy a picnic among the vineyards. And if you want to take part in the picking and stomping but forgot to bring old clothes, they have Vine To The Glass t-shirts on sale for that very reason. It's a free event and everyone is welcome. A full program will be released in a few weeks. You can also have a go at traditional grape stomping in an oak barrel at Hunter Valley Resort. It regularly holds wine appreciation classes as well as other activities including pressing grapes by foot. It's a fun way to learn how grapes were crushed into juice before machines were used. Minimum numbers apply and bookings are essential. $35pp (cost is subject to seasonal grape availability). Another event where you can squish grapes between your toes is the Cessnock Stomp Festival, held on April 28 to celebrate the end of vintage. It's a street festival that takes over Vincent Street in Cessnock, which is lined with wine, beer and food stalls with markets, live music and lots of activities including the star attraction – The Great Cessnock Stomp with barefoot grape stomping in barrels.